In California, 54 percent of adults 65 and older are living below 200 percent of the federal poverty threshold. The average age of a homeless person in California is 55, and this number is increasing – in ten years, it will be 62. Cuts to federal and state housing programs have left few funding options for developers seeking to build affordable homes. As the Legislature contemplates over 130 bills seeking to address the statewide housing crisis, it is important to remember that older adults and persons with disabilities have a special set of housing needs that the Legislature must consider when drafting housing policy. For instance, despite a median age of 57, homeless older adults have health conditions and functional status similar to, or worse than, an average adult in his or her seventies or eighties. Housing IS healthcare. The prevalence of chronic conditions and frailty increases with age. In many cases, deteriorating physical and cognitive functioning impede the ability to live independently in the community. Without a safe, stable place to live, it is difficult for people to receive proper and effective preventative care and treatment for chronic conditions. Growth in the overall, minority and disabled populations will place unprecedented demands on the provision of health care and aging-related services if we do not do something. Affordable housing properties linked with health and supportive services have proven to help significantly in meeting the varied needs of lower-income seniors while also helping address multiple public policy priorities. Affordable housing providers are no strangers to service enriched housing – they have been doing it for decades. However, it is very difficult to create service enriched affordable housing for seniors and people with disabilities in California. The single biggest reason is that there is little funding to build affordable housing for these populations. California is simply not producing enough affordable units to keep up with demand. Unfortunately, the Governor’s May Revise did not include any new funding to address the housing affordability crisis, putting the onus on the Legislature to help solve the funding predicament. The Collaborative is supporting three bills that seek to help fund the development of affordable housing in California – AB 71 (Chiu), SB 2 (Atkins), and SB 3 (Beall). LeadingAge California is working closely with the Collaborative to advocate on behalf of these three bills and raise awareness among Legislators about the need for affordable homes for our older adults and persons with disabilities. 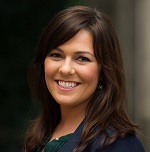 Meghan Rose has been Director of Policy for Housing and Home- and Community-Based Services for LeadingAge California since 2014. Her chief responsibilities include advocating in the State Legislature and working with regulatory agencies to help expand affordable and service enriched housing to California’s most vulnerable seniors. She oversees the coordination of policy and grassroots events, such as the Annual Affordable Senior Housing Resident Advocacy Day, and writes articles for LeadingAge California’s Engage blog and magazine. She is a registered lobbyist, a certified Assisted Housing Manager, and a licensed attorney with the California State Bar.